Training for a fall marathon or half-marathon? Check out these gear recommendations. All items are now available at any of our three convenient locations. 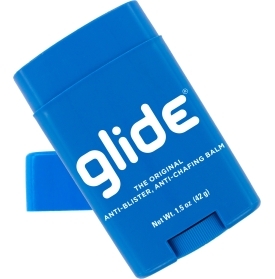 Why: Roll it on before the run to eliminate, or at least reduce, painful rubbing and chafing! Why: Do you drive to meet friends for weekend long runs? Don't you hate climbing into the car all sweaty? The Transition Wrap clips around your midsection or waist to give you some privacy while changing, even in a busy parking lot, then hooks over your seatback to keep your seats clean and dry. Why: As summer turns to fall, it gets light later and darker earlier. Whether you're running in the morning or evening, you need to make sure that drivers can see you. We have a wide range of vests, blinking lights, and reflective accessories. Why: Like their synthetic counterparts, Feetures Merino+ fibers wick moisture to keep your feet dry and odor-free. But Merino also insulates your feet even when wet, keeping your feet warm in snowy or rainy conditions. Why: Getting the right shoes and inserts can make a world of difference, but once the miles start adding up, they're often not enough. You need to be stretching, icing, and massaging your muscles to stay loose, mobile, and pain free! Ask us for tips on crafting an effective injury-prevention plan.